I’d never tried stuffed clams until Matt and I took a trip to Boston. It was at a little seafront restaurant we had popped in after a Sunday of shopping. I immediately adored the flavour and texture of the stuffed clams – the sharpness of the lemon and the saltiness of the clam meat. They were so good, I decided I had to learn how to make them, which was actually surprisingly easy. I spent a good few weeks playing around with flavour combinations before settling on this recipe, which I think really captures the taste of New England Stuffed Clams. 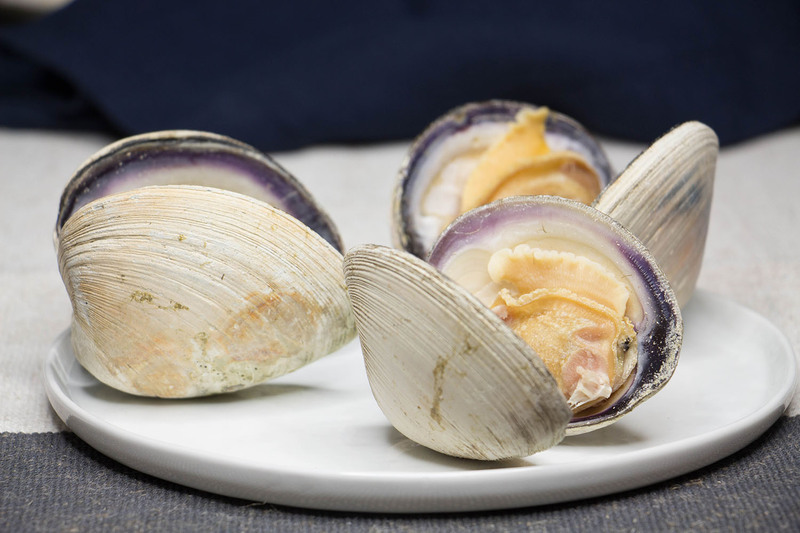 I used Quahog clams for this recipe because they’re large enough to stuff and have a beautiful purple rim which looks so good when stuffed. If these aren’t local to you, look for any large shell clams. I’d recommend buying enough shells for how many servings you want to make, then buy some frozen clam meat, at this will be a little cheaper and much less hassle! This recipe used 6 clams (so 12 half shells) and I just picked the nicest 10 half shells of the bunch to stuff. 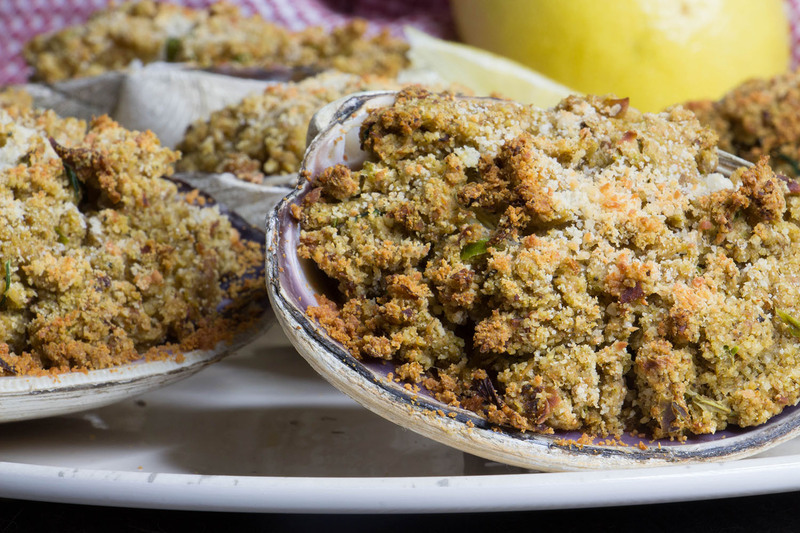 When all of your delicious stuffed clams have been eaten, don’t make the mistake of throwing all the clam shells away. Pick prettiest few of the bunch and put them in the dishwasher. They look so good that Matt and I use them as little butter dishes when serving seafood to guests. You’ll want to start by steaming your large clams. Put 3 inches of water on a medium heat and bring to the boil. Add in the clams and put the lid on your pan. Steam the clams util their shells open, which will take 8-10 minutes. Keep the clam water as you’ll need it later! Add the clam meat, breadcrumbs, paprika, lemon juice, salt and pepper and parsley and stir for around 2 minutes. Now remove the pan from the heat and use a little of the clam water at a time to combine the mixture. Spoon the stuffing mixture even into the cleaned clam shells and sprinkle with the Parmesan. 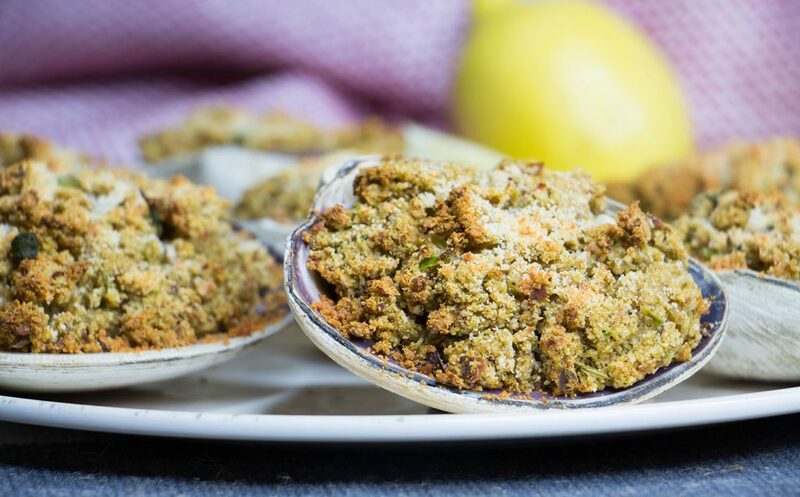 Place the stuffed clams on a baking tray and put in the oven and bake for around 20-25 minutes, until the stuffed clams turn golden and crispy.